I love this alpha - can you see the butterfly wings in them? Remember what the butterfly represents? (Hint...look back in the archives for the post LoveHeartQP). These letters just look like a party to me! You know, the coolest thing...when one of us repents for our sins and asks Jesus Christ to be our Savior, giving Him our lives in love and obedience from that day on, and we obey Him and are immersed in water baptism in the name of the Father, the Son and the Holy Spirit, we just caused the most awesome party in heaven!?!?!?! Isn't that just amazing? I think of that every time I see someone get saved! Party!!! I know, I know...what about the name...StatenIslandAlpha? My husband named it! LOL! Looked like life in the big city to him. 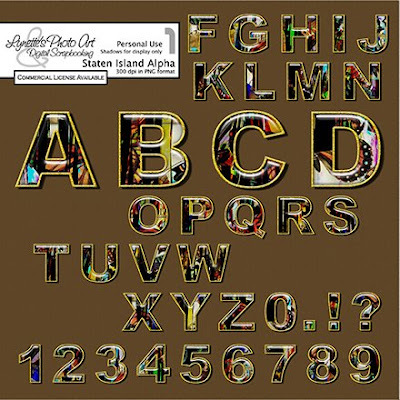 I thought first that "Staten Island" was the name of a font ! Thank you very much, indeed it can suit a picture taken in town in the evening or at night ! Thank you so much for this Freebie. I want to let you know that I posted a link to your blog in Creative Busy Hands Scrapbook Freebies Search List, under the Alpha(s),Font(s), Word Art(s) post on Mar. 02, 2009. Thanks again.